The month of October continues to be a busy month for the Early Detection Program. On Saturday October 15th I had the opportunity to attend Dress Barn’s Annual Women’s Wellness Event. Being a women’s clothing store, the employees were extremely involved in promoting breast cancer awareness during the month of October! I was happy to encounter a few women throughout the day that qualified for our program. Again, the EDP program is a grant program based at the Community Health Center (CHC) in Middletown, CT that provides underinsured and uninsured, low-income women and men access to a variety of screening services in regards to cervical, breast and colorectal cancer. I was happy that I could get a few women on board with our program! While I was able to enroll a few women in our program, mostly what I found was that women were quick to say that they already had health insurance, but when I inquired further, I discovered that many of these women were not getting their annual pap smears and mammograms. This really shocked me!! I realized that most women weren’t fully educated as to why they might need these screening procedures performed annually. I realized that while many women might be fortunate to have health insurance, they might not necessarily be educated in these matters regarding women’s health. Remember that cancer doesn’t discriminate. It doesn’t matter how well insured you are or how beautiful you look on the outside. So, I would like to encourage all women to take an initiative to get these exams yearly! Below are two of Dress Barn’s employees promoting breast cancer awareness. They were handing out pink post cards that day. The post cards served as reminder cards that you could send to your female friends to encourage them to get their annual check-ups! I thought this was a wonderful way to connect with friends and promote women’s health and wellness! 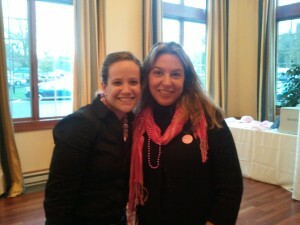 The following week, program manager Marie Yardis and myself, had the opportunity to attend the annual ‘Get in Touch with Breast Health’ event at the River House at Goodspeed Station in Haddam, CT. At one point in the evening a woman dressed in a black sweater with a pink scarf wrapped around her neck approached our booth. I noticed that she was wearing a pink sticker on her sweater that read ‘survivor’. We started chatting and not long after, Marie realized that she recognized this woman. Marie recognized this woman as the creator of Marie’s wedding cake!!! Here is a photo of Marie and Donna at the event! It is indeed a small world and it is true that at some point in your life, you will know someone diagnosed with cancer. So, please do your part and spread the word. Early detection is the key to survival and because of early detection and the right treatment we have the opportunity to see reunions such as this one!